FilePort is an intuitive piece of software designed as a superior alternative to the default Windows Explorer. The application makes it extremely easy to browse and search your folders. The program has a functional UI, that provides you with a handy search function, and you can access it from the system tray or through its keyboard shortcut which can be customized. 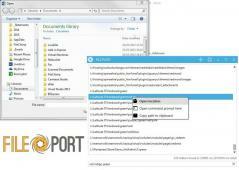 FilePort makes it possible to index commonly used folders and search them in its main window. While it doesn’t show the contents of your folders, it does provide a convenient solution to quickly find the files you’re interested in.